If you have to fight to get someone's attention, then there's a good chance you're not their intention. Life: it's a wheel of favors, appreciate and cherish it whilst it still turns towards your direction for today might be your last chance. Enjoy the ride. There is only a thin line of demarcation between chance and luck. Those who are termed as lucky are the ones who have taken the chance and applied their hard work on it to become lucky. So, chance is an opportunity that knocks your door and it does not knock twice. Avail of this chance judiciously. 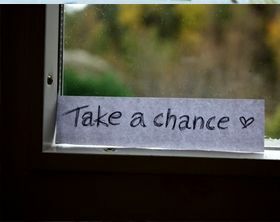 If you fear to take chances, you can never become successful in life. Chance quotes are the sayings of people who have taken up this challenge and converted the opportunity into success. They are inspirational for your friends or others as they are not only an experience but also a good source of information from which you can learn a lot. Chance involves a certain degree of risk but it is worth taking the risk, considering the positive side of it and forgetting about the negatives.